On October 12, Elvis Costello will release his newest album, Look Now. It will be with his current band, The Imposters. The new album will feature twelve new songs (see list below) and will be issued in a variety of forms via Concord Records. 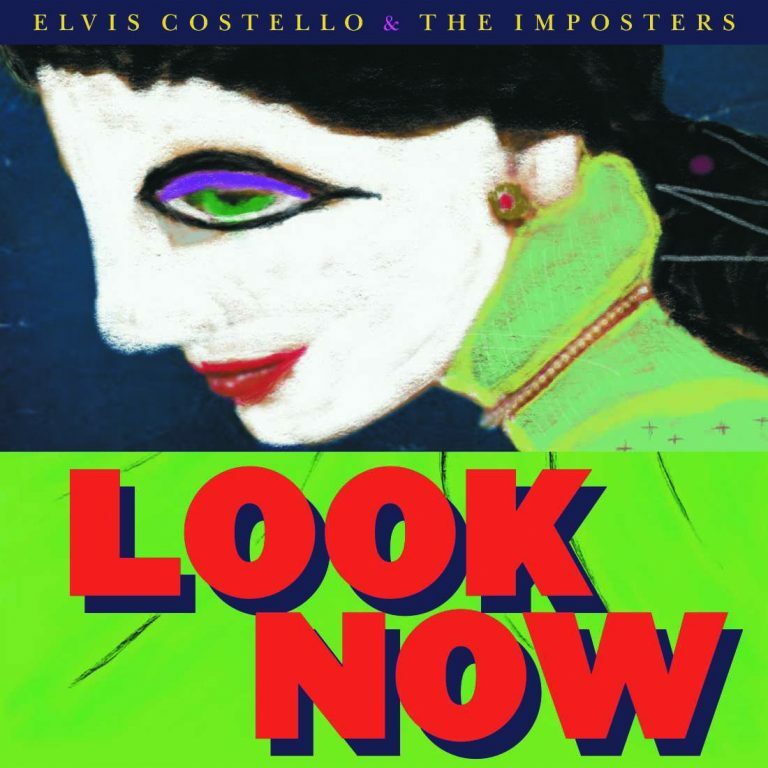 Elvis Costello & The Imposters have previously delivered two albums, The Delivery Man (2004), and Momofuku (2008). Look Now will be issued on CD, a Deluxe Edition, and standard and HD DD. (I’m sure a vinyl LP is in the works as well!) The Deluxe Edition will provide an additional four songs, one an Elvis Costello solo tune from the film, Film Stars Don’t Die in Liverpool. 11 – Why Won’t Heaven Help Me? Great news - and it'll be interesting to see when the "older" new songs (Unwanted Number, Burnt Sugar and Suspect my tears) were recorded. They go back a long way. Ps - it's a birthday present for Sulky from Elvis! Loving that cover, it's gonna look great on 12" vinyl. Hope the vinyl stretches to include the four bonus cuts too PLEASE. WE ARE LUCKY IT IS SOON UPON US!!! Elvis has said that Burt came to the recording sessions and that they recorded two EC/BB songs. Don’t Look Now, Photographs Can Lie and He’s Given Me Things. Last edited by sweetest punch on Mon Jul 23, 2018 3:41 pm, edited 1 time in total. They’re being saved for the next album or the Special Collectors Deluxe Limited Numbered version. The Jazz Echo website seems to say "Under Lime" and "Unwanted Number" will be released Friday, July 27. The cover is most likely by Elvis himself, like his iPad images for the booklet with last year's tour. Maybe it's his way of giving emphasis to the core album , the 12 tracks. I daresay they will work well together , sequenced for a certain effect, maybe six tracks on each side of the vinyl and so on. Now you have an option of going for that. That's for the punters who choose that way of listening to an album, start to finish. Right now I'm planning to only get any vinyl edition , and download the extras. Well, it's his bluntest, least-'flowing' album title. But the song titles are exciting - and how about the decades-later re-emergence of the Carol King song, and Unwanted Number?!!! What more so than "Spike" ?! I hope it's better than that album ( sorry Mr getgood ) I love the graphics - wish I'd been able to get one of the books sold at the Imperial Bedroom and Other Chambers gigs in the U.S.
Have to say I agree with Neil though. The new title didn't really jump out at me when I first read it. Wonder what the inspiration behind it is? Well, it's his bluntest, least-'flowing' album title. Good point, Sulky. And it doesn't matter about the title, as long as the songs are great. Sooooo looking forward to hearing this! 'Under Lime' - suitably cheery title from our Elv. I guess all he's been through it was hardly going to be Club Tropicana - I'm just glad there's the will power and the drive to get material out and the "old" new songs are so exciting to know we'll finally hear them finally hear in a polished manner. I guess I'll just listen to the singles on Spotify (if they're there), then buy the CD when it comes out. Funny that there's been no official announcement from Elvis, though! The link to MusicTap is dead. They published this info problably too soon. But, as Elvis said: the official announcement is imminent. Steve's partner Muriel commented on my Facebook post that I had the news before them ! johnfoyle wrote: Steve's partner Muriel commented on my Facebook post that I had the news before them ! EC tweeted criticism at some guy who called Look Now "his first rock album in ten years" and confirmed that the preview tracks are coming Friday. For a song or two. I reckon this is a lyric from the new album! Last edited by MOJO on Wed Jul 25, 2018 7:36 am, edited 1 time in total.